In 2016, 744 million litres of sparkling wine were exported by the European Union's (EU) Member States. 62% of these exports (465 million litres) went to other EU Member States. Italy (335 million litres of sparkling wine exported in 2016, or 45% of the total EU Member States exports), France (172 million litres, 23%) and Spain (168 million litres, also around 23%) were the main exporting Member States. They were followed at a distance by Germany (32 million litres, 4%) and Latvia (8 million litres, 1%). 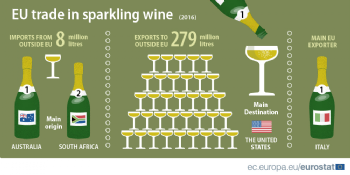 When exporting to non-EU countries (279 million litres in 2016), EU sparkling wine was mainly sent to the United States (114 million litres, or 41% of the total extra-EU exports of sparkling wine), ahead of Japan (26 million litres, over 9%), Russia (25 million litres, almost 9%), Switzerland (20 million litres, 7%), Canada (12 million litres, 4%) and Australia (11 million litres, also around 4%). In 2016, Member States imported 7.6 million litres of sparkling wine from non-EU countries. More than half of these imports originated from two countries: Australia (2.2 million litres, 29%) and South Africa (1.9 million litres, 25%). Other important countries of origin were Chile (0.9 million litres, 12%), New Zealand (0.5 million litres, 7%), Argentina and Moldova (each 0.4 million litres, 5%).